As promised, Jennifer Ward Pelar has delivered a post on Yams. Wow, who woulda thought a little sweet potato could cause so much confusion? and look at all those pics! The gal’s cookin’! I get the letter “Y”! I choose yam. Or sweet potato. Or yam? I’ve heard there’s a difference but, in conversation here in the States, we use the two interchangeably. Curious to discover why, I did some Internet research only to find it can be blamed on marketing! There are two types of sweet potatoes. A pale skinned, firmer variety with light flesh that’s not sweet, and a darker skinned, softer variety with orange flesh, that’s sweeter. The former was introduced into the U.S. first. When the second variety showed up they were purposefully labeled yams to quell confusion. Even today the U.S. Department of Agriculture requires labels with the word yam to accompany the word sweet potato. As a result, many North Americans have been eating the darker, softer version thinking they were yams, and have never even seen an actual yam. Besides the fact they are both flowering plants, the two have very little in common. They aren’t related at all, and wouldn’t even be considered distant cousins in the human world. 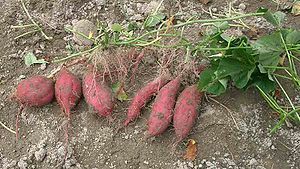 Yams are a tuber of a tropical vine. Sweet potatoes are the root of a vine. 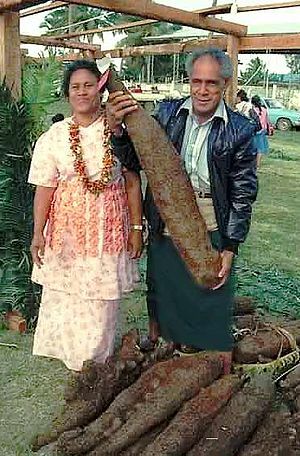 Yams are long, cylindrical in shape and have been around since 50,000 B.C. Sweet potatoes are short and blocky in shape and were consumed in the Prehistoric Age. Yams are higher in vitamin C and have more sugar. Sweet potatoes are higher in vitamin A, lower in calories, and have virtually no fat. Nutritionally, the sweet potato is the better choice. Yams are large, and can grow up to the size of a man’s arm. The yam has skin resembling the bark of a tree; its flesh can range in color from off-white to red. Grown in the tropics, there are over 600 varieties of yams, 95% of those grown in Africa. To show the confusion, I bought canned yams to make a sweet potato pie. Even though the can claimed YAMS in bold white letters the first ingredient listed on the can was sweet potatoes! I used Norah’s recipe from See. Read. Cook. Passed down from her mother, Norah claims it’s the best, hands down. Well, you know I had to try it! I halved the recipe, used olive oil instead of butter, and mixed white sugar with sugar in the raw. I creamed the olive oil and yams with the food processor. I still had enough to make two pies. I made baby pies with the left overs, improvising with a graham cracker crust. They turned out beautifully. Is there food from your country or region that causes confusion – like yams and sweet potatoes caused me? Filippone, P. (2006). Sweet Potato and Yam Difference. About.com Guide. Retrieved from http://homecooking.about.com/od/howtocookvegetables/a/sweetpotatodiff.htm. Library of Congress. (2010). Everyday Mysteries. Fun Science Facts from The Library of Congress. 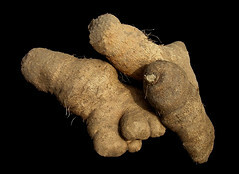 Retrieved from http://www.loc.gov/rr/scitech/mysteries/sweetpotato.html. Reinagel, M. (2010). The Difference Between Sweet Potatoes and Yams. Self Magazine. Retrieved from http://www.self.com/fooddiet/blogs/nutritiondata/2010/11/the-difference-between-sweet-p.html. M Sisson. (2010, November 17). A Visual Guide To Yams and Sweet Potatoes: Mark’s Daily Apple blog. Retrieved from http://www.marksdailyapple.com/difference-yams-sweet-potatoes. Your TX friend’s response made me laugh. It was sweet. I agree. And you’re sweet enough as it is. You don’t need all that sugar!